Fourth race of a seven race series Dirty Spokes Trail Race Series took place at Gainesville State College trail system in Oakwood GA. This was a second new venue for the year. The course was a fairly flat fast 5.3 mile. The first 2 miles was shared with the 2.5 mile run. The weather was nice for April. A bit of a rain during the week has left the area a bit muddy which added to the fun. The wood bridge crossings were wet which would be a bit of a challenge for several of the racers. I was glad to finish the 5.3m with a good time but most off all was able to see the awards ceremony for the 2.5 mile run which both boys participated. 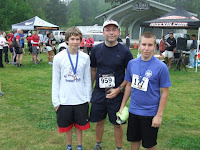 This event was very special in that both of my boys ran the 2.5 mile race. Each of the placed in there age groups which was awesome. Dirty Spokes had laid out easter eggs around the area for competitors to find to redeem for prizes. Scored another beer glass while the kiddos scored a shirt and a water bottle. Another awesome venue. Thank you Dirty Spokes and volunteers for a great race.